When I first saw this recipe I thought it was pretty cool and that “I could make that”. If I was honest with myself, I would have said “I can make that but it’s going to be a pain and not turn out 100%”. Which was exactly what happened. Now, this still tasted good but I had enough hiccups along to the way to make me question whether or not I should have tried it in the first place. Plus, as I may have mentioned before, I’m not the greatest at detail work somthe actual decorating of a cake can be troubling. You can read the recipe here. This took the better part of a morning to put together. Some of that was down time while the cakes baked and some was figuring what to do when something didn’t go right but it was a little time consuming. It took an hour to get both cake batters made and in the oven. I don’t think I had much “trouble” but I will say that the vanilla came out very thick, to the point that I had to spread it out in each of the pans. The chocolate wasn’t as thick but, there was enough of it that I couldn’t really drop on top of the vanilla and swirl it in. I basically covered the vanilla with the chocolate. I still swirled it but it wasn’t quite the same. You can kind of see from the picture that the chocolate stayed on top of the vanilla (each piece is upside down). A suggestion from the comments of the recipe was to just make two vanilla cakes and one chocolate, leaving the chocolate on the bottom. Part of the point is to mimic the look of a White Russian which is darker on the bottom than the top. I would agree with that as an easier way to do it. The main issue I had was with the frosting. The water/sugar mix that you heated up didn’t turn out right. When I added the meringue powder and mixed it, it turned into hard ball of whatever, rather than a smooth frosting. The issue, I think, may have been our stove. I put our candy thermometer in the pot but then watched it get up to 180 degrees, drop back to 160, go back to 180, and, well, you get the idea. So, well after the 3-5 minutes we’re upmthat the recipe says it should take it never came anywhere close to 240 degrees but I ran with it. And it didn’t work. So, I ended up making “normal” buttercream frosting although I adjusted it for only using butter rather than the butter/shortening mix it called for. I didn’t use the shortening as I had all this butter sitting at room temperature and adding in the shortening would have made way more than I needed. In the end, I could have used a bit more. The white frosting was harder to spread than the chocolate, which makes sense as I still added the chocolate mixture to the frosting. I had plenty of the chocolate frosting so instead of having the chocolate go halfway up the sides, I had it go all the way up and just the white on top. Still gave it the desired effect, I think. Lastly, I did add the icing but I shouldn’t have done it. It was too thin and just ran off the cake and pooled on the platter. Very frustrating. Overall, the taste was good. People liked it. You couldn’t taste much of the alcohol but as I kept telling people, there wasn’t much in it and then it was only Kahlua. I’ll be honest and say that I felt the cakes were a little dry but no one else thought so. So, I do recommend this but be forewarned that it takes a lot of effort. 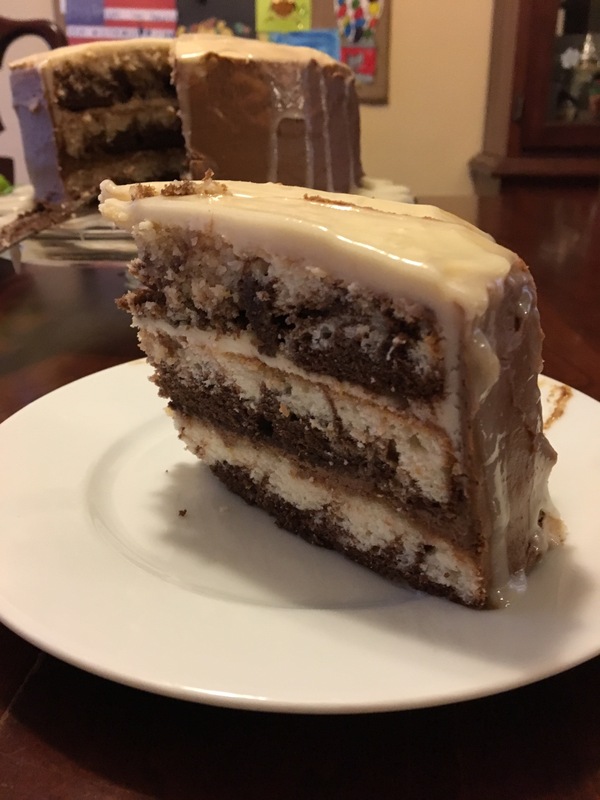 This entry was posted in Alcohol, Cake and tagged buttercream, Cake, chocolate, dessert, kaluha, king arthur flour, white russian. Bookmark the permalink.